More than one million children worldwide participated in the program and produced original artworks depicting their place in the world. These works have been exhibited widely and published in textbooks on child development. 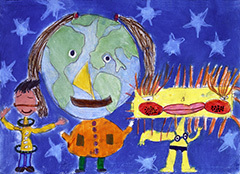 The 2nd AO winners then came to Washington, DC for the World Children’s Festival 2003 held on the National Mall.